Creating works of art from stone and rocks dates back to the earliest history of mankind. The numerous artifacts, spear points, arrow heads, knives, scrappers and so forth, made from stone and rock is the actual proof of man's early existence. The early Egyptians developed faceting stone (cutting) to create jewelry using lapis lazuli, turquoise, amethyst and other rocks. Early inhabitants of the Indian subcontinent wrote numerous treatises on lapidary arts, often discuss the sources of gems and diamonds, the origins, qualities, testing, cutting and polishing the different materials to create jewelry from them. There has been a continuous practice of the lapidary arts since the early man to present date. In our modern world we now have the benefit of being able to use good quality equipment to make the work of polishing, faceting and grinding stones much faster. For years I have picked up rocks, attended gem shows, visited rock shops and envied those who had equipment to do lapidary work. 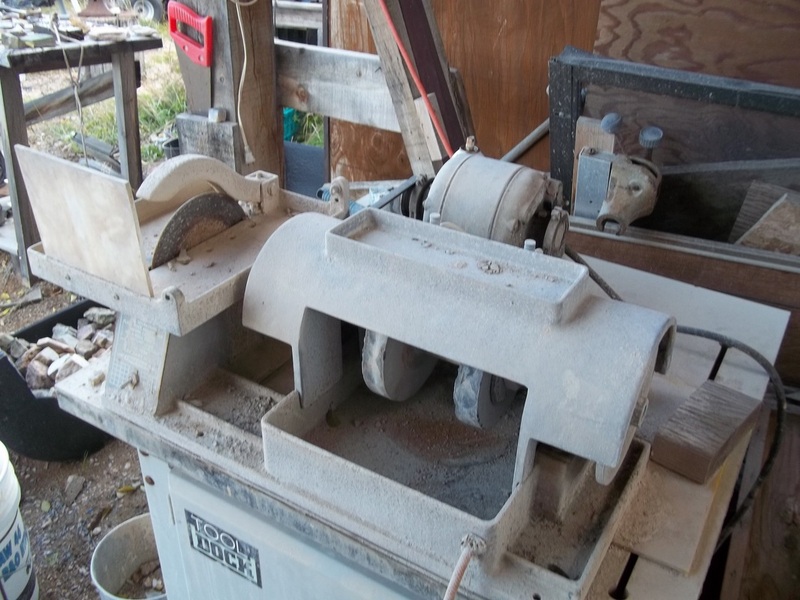 In May of 2013 I found a ad on Craigslist for some lapidary equipment. After seeing what was for sale I bought all that the person had for sale. 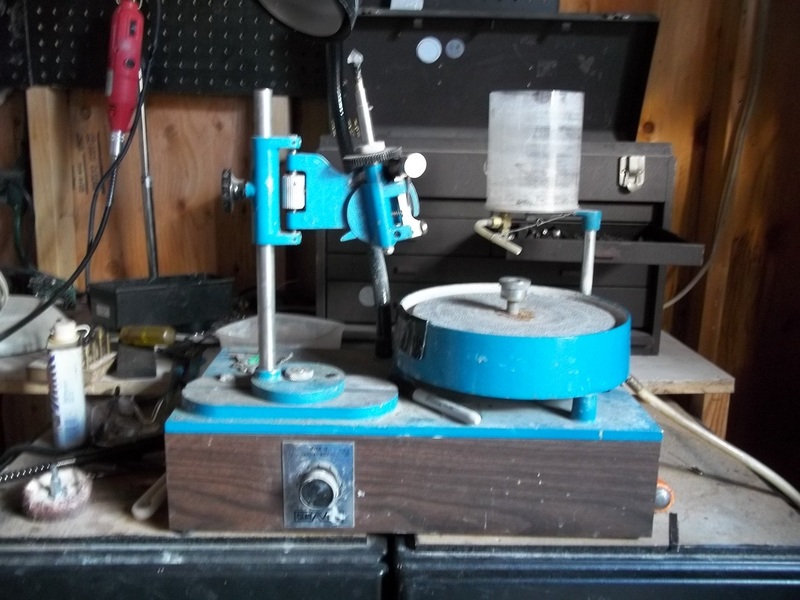 I got a ten inch rock saw, a vibrating polisher, a 16" wet belt polisher, a combination 7" rock saw with two grinding wheels and a polishing disc, a cabochon polisher, and a faceting machine. I setup most of what I had bought and started playing with it attempting to figure out how to use these neat tools. The combination rock saw with the grind wheels needs different grinding wheels but works great to cut slabs and trim out cabochons. The current grinding wheels are in poor condition and are silicon carbide which contaminates my diamond wheels on the cabochon polisher. The Graves Mark 4 faceting machine is great, it takes hours of practice to turn out good gems, and slowly I am understanding how to work this machine. I have not made any gemstone that are good enough to share yet, hopefully soon. Winter months are approaching, hopefully I'll have days to spend by the fire playing with this faceting machine. Combination 7"saw and grinder I use water for the coolant and lubrication to saw a slab of rough rock. Water splatters contains the rock dust which coats everything around the saw. It is amazing to find the hidden beauty in rocks. Although most rocks are neat just as they are found, slicing one with a saw displays more of it's character which is further enhanced by polishing it. Doing lapidary is one of the three major related obsessions of mine. The search, prospecting, involves spending days walking over the mountains. 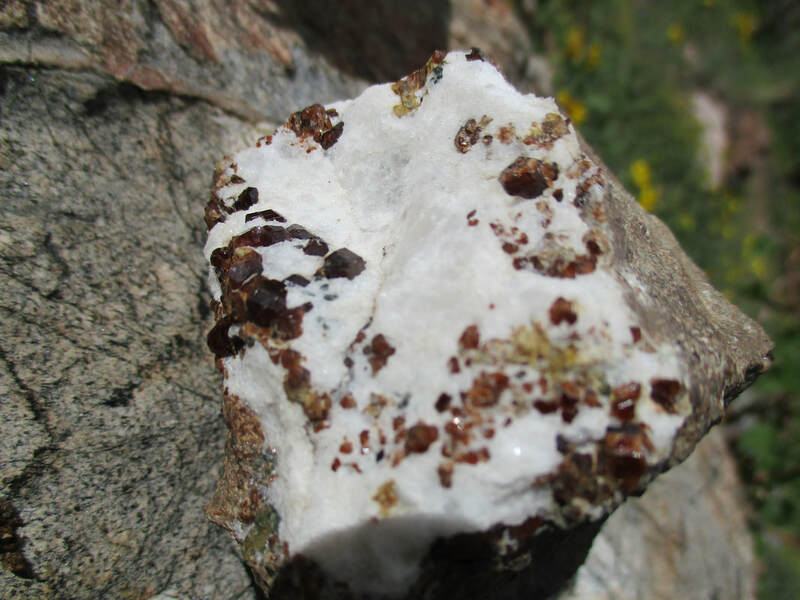 Once in awhile you do happen to discover a remarkable deposit, lode, of a nice mineral. 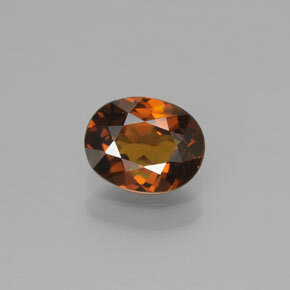 ​Like these garnets in the photo below. ​Which ends up some thing like this.